Movistar's Nairo Quintana is currently at the third position of the General Classification of the Vuelta a España at 14 seconds from race leader Simon Yates. After one week of racing, the Colombian is one of the favourites to take the overall title. "I think that by sitting in the third position and with the mountains we have left, I have a big opportunity to win the Vuelta," he commented to Spanish news agency EFE. "I will keep working to achieve that. The objective was the Tour de France and that didn't work out. Now I'm fine, I will have a good chance." 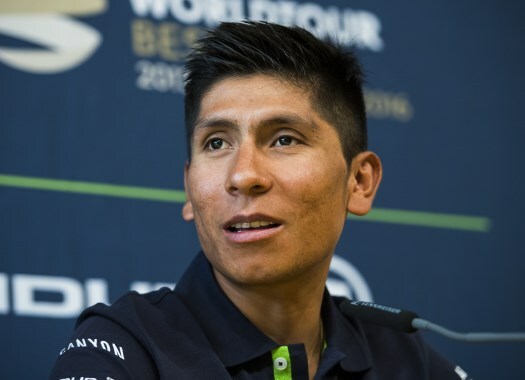 Quintana acknowledges one of the main rivals to keep close. "Yates is the strongest and the rider that has shown to be the most active," he explained. "The other day he launched a strong attack and he took some seconds. He is a rival that is feeling fresh after the Giro and who has a good team. He's one of the rivals that we have to keep an eye on." The rider is preparing for a week for which he has a lot of expectations. "The route will tell which will be the moment to take the lead of the general classification, but I'm sure it will be a mountain day," Quintana affirmed. "We have a good team and we are at a good level. On the next rest day, I hope to be wearing the Red Jersey." "The most decisive day will be the one of the Lagos (de Covadonga). That day will be differences and we will see how are the rivals. The Colombians have shown to be strong and also LottoNL-Jumbo. It will be war and the fans won't be bored."